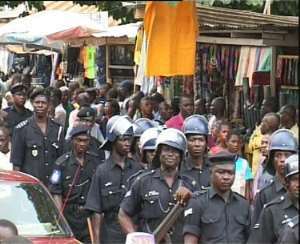 Highly places sources in the police administration say the deployment of armed police to radio stations in Accra last night (Thursday) was part of routine night patrols being undertaken by the security agencies. A number of the capital's radio stations remained under police guard overnight, in an exercise that surprised night shift radio staff who had no prior knowledge of any exercise by the police to secure their premises. But sources at the police headquarters told JOYNews that last night's exercise was part of a routine to protect places of strategic security importance. The sources said the exercise will continue for as long as the security agencies feel there is a need to deploy guards at the strategic installations, including electricity power houses and other places crucial to national security. Meanwhile, the Deputy Information Minister Stephen Asamoah Boateng has dismissed suggestions that the deployment of armed police personnel to the radio stations was prompted by the recent press conference held by the opposition political parties. Speaking on JOY FM, Mr. Asamoah Boateng insisted it was a routine exercise. The deputy information minister said the security agencies realise the need to protect the country's peace and are simply being proactive.